Hello guys, hello boys and girls and welcome back to Robby’s Accent Adventure video blog, where we learn to speak like American English speakers. Yes! 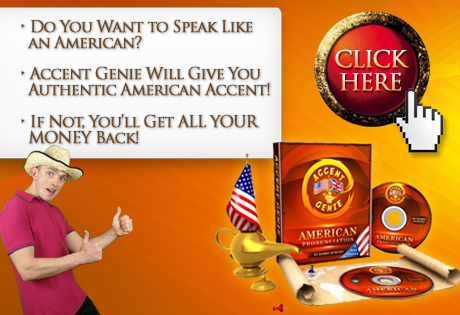 I’m trying to sound like American currently and I’m putting on my general American pronunciation and in case you’re wondering how that’s possible, how we can achieve the same kind of results, you definitely may want to check out the Accent Genie program. I was following the same principles outlined in the program and you’ll be repeating hundreds upon hundreds of sentences spoken out loud by a native English speaker and you’ll be repeating them and you’ll be focusing on the key sounds. What I’ve done with those videos is I’ve gotten rid of all the irrelevant stuff. And you’ll be only focusing on the sounds that will actually enable you of sound like an American English speaker, right? There are so many other courses out there but what they do is they analyze the whole speech and you’re focusing on too many details at the same time. So it’s way too overwhelming. Anyway, let’s get down to today’s business which is contractions: I’ll, you’ll, he’ll, she’ll, it’ll, we’ll, they’ll. Why I’m Talking About It? One Of My YouTube Commentators Asked Me To! And the reason why I’m going to be talking about them is I was asked by one of my YouTube commentators to make a video about them and specifically how to pronounce them in fast and slow speech. And he asks me that because there’s only one – according to him – there’s only one video on YouTube and that person isn’t even from an English country and doesn’t sound like a native English speaker. And I really appreciate your comment because by reading that you would think that you think I sound like a native English speaker which is a great thing. Thanks for saying that and anyway, I’m not a native English speaker. My native background is Latvian. I come from Latvia and I’ve been living in an English speaking country for 14 years now, right? Not 40, 14. But it’s not the United States, it’s Ireland. But anyway, I’ve always taken such a great interest in everything that’s got to do with the United States that a few years ago I decided to teach myself how to sound like an American English speaker. And I’d like to think that I have approached that level where one would hear that I sound like a native American English speaker, right? It’s the Dark ‘L’ That You’ve Gotta Be Focused On Here! Anyway, sounds I’ll, you’ll, he’ll, she’ll, it’ll, we’ll, they’ll is a typical dark “l” sound. And actually it happens so that a few years ago I recorded a video about the two different “l” sounds. The light “l” and the dark “l”, right? So you may want to check out the video here, in that you’ll find out everything there is to know about the dark “l”. But anyway, nonetheless I’m going to read out these following sentences that I wrote down there in order to show you how to pronounce these sounds in these specific contractions, right? So I’ll do it. I’ll do it. Or slowly, I’ll do it. Well, to be honest with you, I don’t really see the big difference, I’ll do it or I’ll do it. One way or another the “l” sound is the dark “l”. L. I’ll do it. I’ll do it, you know. It’s not I’ll do it. It’s “l”. It’s a bit more throatier than the light “l” sound, right? You’ll see for yourself. You’ll see. You’ll see for yourself. You’ll see. You’ll. You’ll. You’ll. It’s a bit throaty. So you definitely refer back to that video made a few years ago. So that’s the way you pronounce these “l” sounds in these contractions. You’ll. You’ll see for yourself. So you’ll. Then you kind of swallow the sound. You’ll. Almost like that, right? You’ll see for yourself. And as a matter of fact, this “l” sound is very characteristic to American English speakers, so you definitely may want to get it right. You definitely may want to nail it. You may get the other sounds so-so but once you get the “l” sound which gives you the throaty sound, that’ll definitely make you sound like an American English speaker. He’ll Come Around, Don’t Worry! He’ll come around, don’t worry! He’ll come around, don’t worry! He’ll come around. So again, it’s the typical dark “l” sound. He’ll. It’s almost like the llll. He’ll. Obviously I’m exaggerating but it’s just to make the point, right? He’ll. He’ll come around. She’ll be back for more. She’ll. She’ll be back for more. She’ll be back for more. She’ll be back for more. She’ll be back for more. She’ll. Again, the same old dark “l” sound. One Way or Another It’ll Happen! One way or another it’ll happen! One way or another it’ll happen! What’s curious about this particular contraction “it’ll” is that the “t” sound becomes the flat “t”. It’s something between “t” “d” and a little bit of “r” as well. It’ll. It’ll. It’ll happen. It’s not it’ll happen. It’ll. But it’s it’ll happen. It’ll. It’ll. Right? So you have to imagine that you’re pronouncing both sounds “t” and “d” at the same time. It’ll. And a little bit of ”r”. That’s what helps me to get the sound right. Okay? So it’ll happen. We’ll figure it out. Again, the same dark “l” sound. We’ll figure it out. They’ll regret it. They’ll. They’ll regret it. They’ll regret it. Dark “l” sounds all along, nothing really changes, so definitely want to get it throaty more than anything. Think about the throaty sound and that’s what’s going to help you to get this right. So I’m hoping that I created something useful, that you’ll learn something from this video and you definitely may want to go back where I am reading out these sentences and repeat after me to get the sound right. All right? And you won’t regret it my friends, right? Thanks for watching this video. Obviously, if you have any questions of any nature, well preferably something that’s got to do with the American pronunciation, please post them in the comment section below. Chat to you soon and bye-bye! Next post: How Native English Speakers ACTUALLY Pronounce the TH Sound!